Traditional clay paver bricks or concrete brick pavers are ideal for home walkways and patio construction. Traditional clay paver bricks when configured in a Herringbone, Basket Weave or Running Bond pattern can provide a classic walkway look. However the new and various shapes, styles and colors of concrete brick pavers that keep being introduced by companies such as Bolduc, provide for some very interesting patterns and looks for patios and walkways. Traditional clay bricks typically have dimensions of 4”x8”, where as concrete brick pavers can come in all shapes and sizes. Paving clay bricks are especially designed for ground cover and traffic and can withstand severe temperatures and weather conditions. Traditional clay paver bricks can be purchased with beveled edges, chamfered edges (to help with water run off) or standard edges and come in many different colors and finishes. Concrete pavers manufactured by companies such as Bolduc come in many different shapes, sizes and colors and can support traditional and new patterns. Typical colors included Browns, Grays, Reds and Beiges. 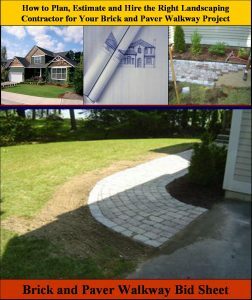 Concrete brick pavers can support Herringbone, Basket Weave, Running Bond, and Module patterns as well as Circles and other patterns. Concrete brick pavers can also come in various finishes including Classic, Antique and Grenart. Concrete paver manufactures frequently warranty their products for up to 25 years and include protection for abnormal deterioration due to the use of deicing salt. Normally bricks and pavers are sold at the piece level, but frequently they are priced on a per square foot basis. With traditional 4 inch by 8 inch bricks, 4.5 bricks are required to make one square foot. Prices for clay paver bricks and concrete pavers vary but in general a homeowner can expect to pay 50-75% more for concrete pavers than traditional clay bricks. Clay brick pavers typically cost between $2.5 and $3.0 per square foot, where as concrete brick pavers typically cost between $4.5 to $5.0 per square foot. Key to any successful walkway or patio construction is properly preparing the area for supporting the bricks. 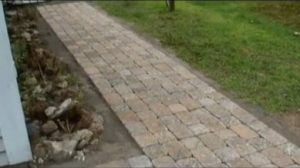 It is recommended to have a base layer of 4 inches of compacted gravel and 2 inches of compacted sand for setting the clay brick or concrete pavers on. Whether you choose clay paver bricks or concrete paver bricks for your next walkway or patio project, either one will dramatically enhance your home’s appearance and provide a high return on investment.